Are you looking for a dessert to make your special friends fell loved? 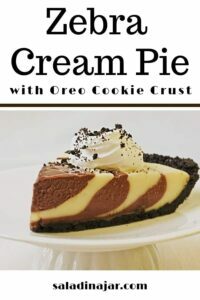 Try Striped Zebra Cream Pie. 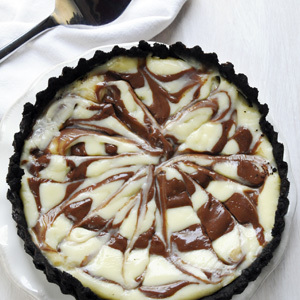 Not only is it fun layering chocolate and vanilla cream in a dark chocolate cookie crust, but it is fun to eat, also. Have you ever found yourself in a day job that doesn’t allow for much creativity? Same here. So the kitchen is my outlet. Not long ago I read about a zebra cake on The Whimsical Cupcake and a tiger cake on Daily Salt that caused me to imagine a pie using a similar technique. Apparently, God was in a creative mood himself when he made zebras. Not only are they strikingly beautiful but every zebra has a unique, one-of-a-kind stripe pattern comparable to our thumbprints. Elike zebras, every time I put this pie together, it looks a little different. But no matter. The taste is the same– mostly chocolate in the same way chocolate and vanilla swirled ice cream tastes mostly chocolate. I experimented with various crusts but my husband deemed the chocolate cookie crust the perfect foil for the light and creamy filling so that’s what I went with– just so you know who the boss is around here. No two pies look exactly alike. Making this pie does not have to heat up your kitchen. 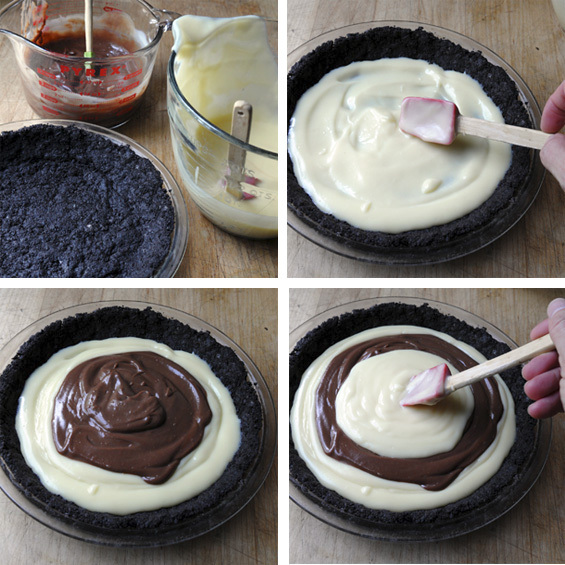 Instead of baking the crust, refrigerate it for an hour or buy a prepared chocolate cookie crust. The cream filling goes together quickly in the blender and is cooked in the microwave resulting in a lump-free, silky-smooth texture in 6 minutes. 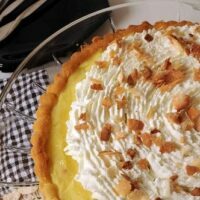 Be sure to allow adequate time for the pie to chill or the layers won’t be so pretty when you serve it. Use a shallow circular motion with a spatula to gently press and spread cream toward the edge. If you think you have totally messed up the layers, use a knife to gently swirl the cream filling and cover with whipped cream. It will look like you planned it that way from the beginning….maybe….hopefully. 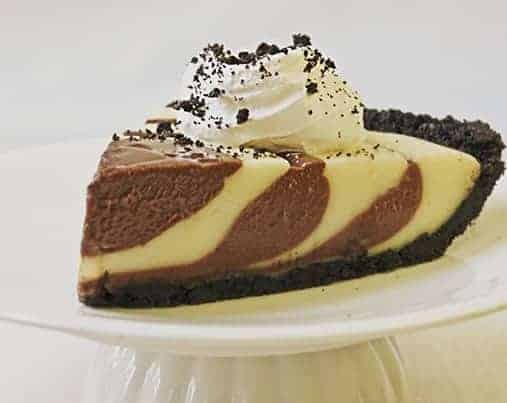 A layered chocolate and vanilla cream pie nestled in a dark chocolate Oreo cookie crust. Cream filling cooked in the microwave. Place cookies in bowl of food processor and pulse repeatedly until you have fine crumbs. (You can also use a rolling pin to crust cookies inside of a closed plastic bag.) Add melted butter and work evenly through crumbs. Press into a 9-inch pie plate using a spoon to smooth and pack crumbs to a uniform thickness. Summertime variation: Instead of baking, chill formed pie crust 1 hour before adding filling. Add milk, sugar, cornstarch, salt, and egg yolks, (in that order) to blender. Blend 5 seconds and pour into 2-quart glass microwave-safe bowl. Microwave 6 minutes on HIGH, whisking till smooth after 3 minutes, then every minute thereafter. Pour through strainer if you see any lumps. Add butter and vanilla, whisking 'til smooth. Pour half of filling into bowl holding chocolate, stirring until smooth. 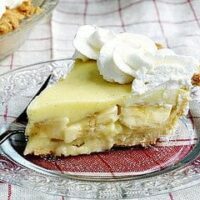 Pour half of vanilla batter into pie crust, carefully spreading it across the bottom and up the sides of the crust. 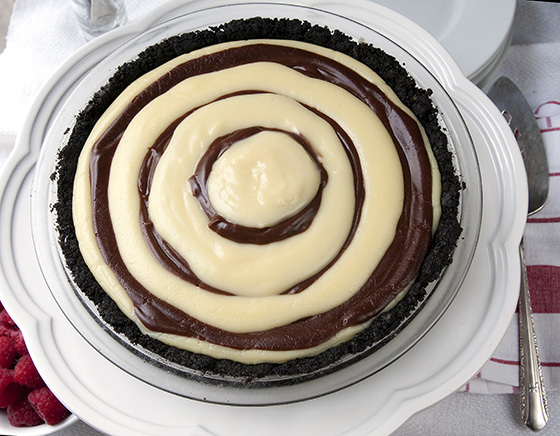 Add half of the chocolate filling on top by pouring in the middle, carefully spreading it over the top of the first vanilla layer leaving a vanilla margin around the outside. Work fast before the cream can cool and thicken. Continue alternating flavors, adding the filling to the center of the pie. It will begin to make a mound. When all filling is used, cover with plastic wrap and use your hand to gently push the cream filling from the center toward the edges until it's flat, being careful not to disturb the rings. Chill at least 4 hours before serving. 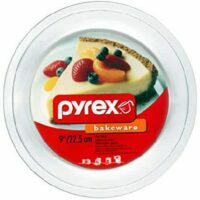 Pyrex Glass Bakeware Pie Plate 9" x 1.2"
Use a microwave to make this super quick, super easy banana cream pie...from scratch. 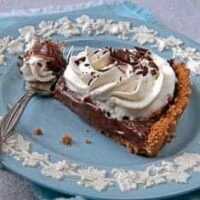 Chocolate cream pie filling (made in the microwave) in a graham cracker pie crust. A smooth and tasty vanilla custard cooked in a microwave oven. I love this idea! I’ve made zebra cake before, but I’m more than a little obsessed with pastry cream so this is perfect for me. My husband just saw your photo and said, “You’ve got to make that!” Done deal. Oh, this is a stunner. And what a plus that you can make it w/o turning on the oven. This pie has such great color contrast. Looks gorgeous. Well done! I love this. I always wanted to make the cake but just never have. I think I would like the pie better over the cake anyway and I’ll have to give this a try. 🙂 Love the first picture! Looks fantastic! I am going to have to try this one out- perfect for bringing to a BBQ! Up to now, what I had seen was a zebra cake, but a zebra cream pie? It looks delicious, and the best of all: how easy to make! That is really cool looking Paula, what fun! You make it look easy. PS. I still haven’t made the honey wheat bread I’m out of town now for 3 weeks, but I will be making it soon. It looks gorgeous from both the top and when cut! Wow! Cold and perfect! Wow Paula! That first shot is awesome. Not only do you make everything look easy but so beautiful as well. Awesome. I’ve seen zebra cakes, but never pie. I could lick the picture! This is beautiful! Every time I get a post from you via email, I am in awe of your beautiful, enticing photographs. And the pie recipe looks divine, too! But let’s face it, we eat with our eyes first. Fabulous and so fun, Paula, I LOVE it! Wonderful pictures too! Oh Paula, you continue to amaze me. This looks so so good. Something this lite and creamy is bound to be low calorie right?????? I know this is bound to be worth it no matter what the calorie count. I will have to make this soon when my sister Judy comes to visit. She won’t believe her eyes! Thanks for another enjoyable post. That would be so cool with meringue on top because when you cut into it it would be a big surprise. Wow! This is looking yummy by the minute to this pregnant mother of ten! 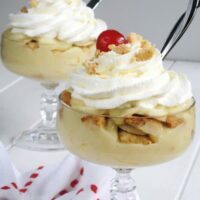 I must find the ingredients and make this NOW! I just found your site and I am looking through it. Mmmm. Good ideas and stuff here! Hi – Is there a link to the recipe somewhere? Thanks. Not sure why the recipe didn’t show up originally but I think it’s fixed now. Let me know if you still don’t see it.